The adventures and life journeys that I have experienced since becoming a kidney patient would not happen without the backing of my sponsors. In differing ways they provide the resources that are essential to make these projects happen and hence, enable me to raise funds on behalf of Kidney Research UK and promote awareness of the organ donor register. Whenever seeking corporate sponsorship I always try to give something in return. The result of this is that I receive much needed assistance and our sponsors have a tangible return on their investment. By using this philosophy I have built good relationships with a variety of organisations, most of which have supported our ventures for at least four years. They have not only benefited from the publicity I receive, but have also used our ventures as a means of promoting a particular product or service. Should you choose to support these ventures I will work closely with all relevant departments ensuring your organisation receives maximum benefit from it’s involvement. 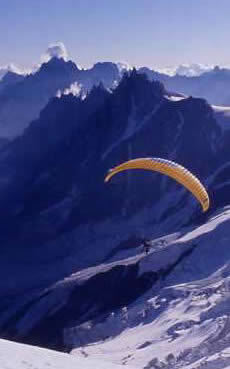 Having climbed Mont Blanc Tony figured the easiest & safest way down was to paraglide off the mountain. Photographs and feats like this are what make these challenges so successful in fund raising for charity. Kidney Research UK is the leading national charity that promotes research into kidney disease and related illnesses. They receive very little government funding so therefore rely heavily on voluntary contributions. Their mission is to improve the health and well being of individuals living with kidney disease. ~ Funding research: Improving the understanding of renal disease, its causes, treatment and management. ~ Caring for patients: Working towards the relief of people with kidney disease. ~ Raising awareness of kidney disease: Informing and updating patients, families carers, the general public and health care professionals about kidney disease and the needs of those effected.